ProSpec's products are furnished for LABORATORY RESEARCH USE ONLY.They may not be used as drugs,agricultural or pesticidal products, food additives or household chemicals. You can nag your dealer until he pins you on to the fender of his SUV, but you still won’t get any. We’re talking about the anabolic wonder stuff that researchers at Ohio State University are doing experiments with. A single injection will change you for the rest of your life into a hulk of the kind that Markus Ruehl [see photo below] would say: that much muscle just isn’t aesthetic. The super steroid in question is not a hormone. It’s a common-cold virus that the researchers have made some adjustments to. Viruses invade cells and release their genes into them. Then the cell obeys the virus genes’ instructions, and makes the proteins according to the genes’ blueprint. The proteins formed are the building blocks for new viruses. The researchers managed to get their viruses to ‘programme’ the muscle cells to make proteins that deactivated the myostatin protein. Myostatin is a protein that muscle cells make to prevent fitness centre owners from having to change jobs and become SUV salesmen. Not that the researchers had something against fitness centre owners. They are looking for a cure for muscular dystrophy. In their study, which was published in the prestigious PNAS, they tested three myostatin inhibiting genes: the gene for growth and differentiation factor-associated serum protein-1 (GASP-1), follistatin-related gene (FLRG) and the gene for follistatin-344 (FS). There are various kinds of follistatin and they all have different functions. As far as we know, only follistatin-344 is active in muscle tissue. The mice in the experiment were given an injection when they were four weeks old. The photos below show their musculature two years later. AAV1 stands for the adenovirus that the researchers used. AAV1-GFP was the control group. The injection with the gene for follistatin-344 was the most effective. This becomes clearer if you look at the figure below, which shows the weight of the mice two years after the injection. But most beautiful of all is the graph below. This shows how the mice’s power developed over their lifespan. The mice in the control group – the green curve – get weaker towards the end of their life. But the mice that were injected with AAV1-FS – the red curve – just keep on getting stronger. The researchers obtained the same success when they injected the viruses into mice that had congenital muscle disease. "The striking ability of FS to provide gross and functional long-term improvement to dystrophic muscles in aged animals warrants its consideration for clinical development to treat musculoskeletal diseases, including older DMD patients", they write. Only a few years, and muscular diseases will be a thing of the past. And all fitness centres will go bust. Proc Natl Acad Sci U S A. 2008 Mar 18;105(11):4318-22. Chemical athletes and their gurus in the doping world have high hopes for myostatin blockers that pharmaceutical companies are testing right now on people with cancer or muscular diseases. Their hopes are well founded – animal studies have shown that myostatin blockers can cause massive growth of muscle mass. But yet another animal study, soon to be published in Muscle & Nerve, suggests that the combination of a myostatin blocker and an old-school doping substance like clenbuterol results in even more growth. Myostatin is a muscle protein that keeps muscle growth in check. Myostatin blockers deactivate the protein and its effect. Because myostatin is active pretty much only in the muscles and nowhere else, scientists hope that myostatin blockers will be the long hoped-for anabolic without side effects. Time will tell whether their hopes are justified. In animal studies blocking myostatin has reduced stamina, and weakened muscle attachments. Researchers don't yet agree on how best to deactivate myostatin. Pharmaceuticals companies like Acceleron are doing tests on synthetic imitation receptors that replace and neutralise myostatin. Another approach is to boost follistatin synthesis. Follistatin is a protein that deactivates myostatin in the muscle cells. Yet another approach makes use of the immune system. Chinese agricultural researchers for example are looking at the possibility of injecting massive quantities of myostatin. These may well lead to muscle tissue breakdown in the short term, but in the long term the immune system would come to regard myostatin as a foreign substance that the body needs to break down. The study that molecular scientists at the University of Hawaii will publish soon is fundamental research. The authors used mice in which the myostatin gene had been deactivated – a bit like Mighty Mouse. The muscles of this type of mice are shown in the lower of the two photos at the top of the page. 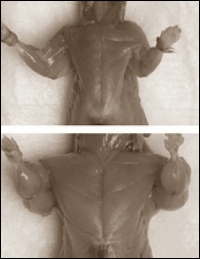 The top photo shows the muscles of a normal mouse. The researchers wanted to know whether these supermice could develop even bigger muscles by giving them a doping substance like clenbuterol [structural formula shown above]. And yes, it worked. M = myostatin-less mice, W = normal mice. 0 ppm = no clenbuterol, 20 ppm = with clenbuterol. The experiment only lasted 14 days. The table above shows that during that period normal mice built up extra muscle mass when they were given clenbuterol, but the myostatin-less mice did so too. Super-muscled myostatin-less mice gain even more muscle through old-school doping. That's promising. Before we forget though: the WADA is already working on a doping test for myostatin blockers. Manipulating the protein myostatin has become even easier. In the Animal Science Journal researchers at the Chinese Sichuan Agricultural University describe how they made pigs more muscular by giving them four injections of myostatin. As a result of the injections, the pigs’ immune system broke down the myostatin. help livestock farmers by developing monster-size salmon, cattle, chickens and pigs. The cattle are there already – Belgian Blues for example – because through a freak of nature they don’t produce myostatin, as in the photo above. The Chinese experimented with a simple technique: they got micro-organisms to produce myostatin and injected 1 mg or 4 mg of the protein into pigs on days 1, 14, 28 and 42 of an experiment that lasted 84 days. The pigs’ immune systems regarded the protein as alien and produced antibodies to neutralise the myostatin. The amount of antibodies produced is shown in the figure below. The genes in the muscle cells that produce myostatin started to work less hard as a result of the myostatin injection. The results were predictable. The table below shows that the animals lost fat and gained muscle. While not spectacular, the effect is significant. The 4 mg injections worked as well as the 1 mg injections. There is much media speculation about the use of new doping substances by athletes, such as techniques that involve genetic manipulation. In practice these techniques are often not suitable for human use. What works in a lab is often too complicated to use in humans. But if a technique is simple enough for livestock farmers to use, then it should be suitable for athletes. It won’t be long before we see myostatin manipulation in the doping world. In fact, we wonder: is the hormone mafia already messing around with myostatin? Anim Sci J. 2009 Oct 1; 80(5): 585-90. Increasing the size and strength of muscles represents a promising therapeutic strategy for musculoskeletal disorders, and interest has focused on myostatin, a negative regulator of muscle growth. Various myostatin inhibitor approaches have been identified and tested in models of muscle disease with varying efficacies, depending on the age at which myostatin inhibition occurs. Here, we describe a one-time gene administration of myostatin-inhibitor-proteins to enhance muscle mass and strength in normal and dystrophic mouse models for >2 years, even when delivered in aged animals. These results demonstrate a promising therapeutic strategy that warrants consideration for clinical trials in human muscle diseases. Muscle-enhancing strategies have been proposed for a number of neuromuscular disorders, including muscular dystrophies and age-related muscle disorders, and have shown promising results to build or regenerate stronger, healthier muscles (1). These strategies have mainly focused on the use of trophic factors, such as insulin-like growth factor-1 that induce myocyte precursor proliferation and myofiber hypertrophy (2). Attention has recently highlighted the potential benefit for inhibiting myostatin, resulting in the doubled muscle phenotype of myostatin deficient cattle (3–5) and myostatin knockout mice (6, 7). Myostatin is a transforming growth factor-β (TGF-β) family member that plays a crucial role in regulating skeletal muscle mass (8, 9). Myostatin appears to function in two distinct roles: to regulate the number of myofibers formed in development and to regulate the postnatal growth of muscles. The regulation of muscle growth postnatally is being explored by various pharmacological methods for a number of muscle disorders. Delivery of neutralizing antibodies against myostatin has shown promise in dystrophic mdx mice (10), yet there have been varying reports on the efficacy to enhance muscles when delivered in aged animals (11). Furthermore, recent data demonstrated muscle mass enhancement and morphological recovery in muscular dystrophy mice treated with deacetylase inhibitors. The resulting muscle enhancement was attributed to an increase in the protein follistatin, which has been shown in part to inhibit the activity of myostatin (12). Trichostatin A (TSA) treatment required daily administration and was not evaluated in aged animals where off target effects may exist. The identification of myostatin binding proteins capable of regulating myostatin activity has led to potential new approaches for postnatal muscle enhancement and expanded the potential for gene therapy to be considered as a method to inhibit myostatin activity. Follistatin (FS) has been shown to bind to some TGF-β family members and can function as a potent myostatin antagonist. Overexpression of follistatin by transgenic approaches in muscle has been shown to increase muscle growth in vivo (13), and a lack of follistatin results in reduced muscle mass at birth (14). Recent data has also shown that follistatin is capable of controlling muscle mass through pathways independent of the myostatin signaling cascade. In these studies, myostatin knockout mice were crossed to mice carrying a follistatin transgene. The resulting mice had a quadrupling of muscle mass compared with the doubling of muscle mass that is observed from lack of myostatin alone, confirming a role for follistatin in the regulation of muscle mass beyond solely myostatin inhibition (15). In addition to follistatin, two other proteins have been identified that are involved in the regulation of the myostatin. Follistatin-related gene (FLRG) is highly similar to follistatin and has been shown to inhibit activin and multiple bone morphogenic proteins in vitro (16, 17). Growth and differentiation factor-associated serum protein-1 (GASP-1) is a protein that has been discovered to contain multiple domains associated with protease-inhibitor proteins and a domain homologous to the 10-cysteine repeat found in follistatin. GASP-1 was shown to bind directly to the mature myostatin and myostatin propeptide and inhibits myostatin's activity (18). Although recombinant protein injections or myostatin blocking antibodies are feasible strategies, gene therapy to express these myostatin inhibitor genes may prove a more efficacious therapeutic route for numerous reasons, including the lack of potential immune response to antibody treatment and the requirement for multiple injections. Here, we report that a one-time postnatal intramuscular injection of adeno-associated virus (AAV) encoding myostatin-inhibitor-proteins resulted in long-term improvement of muscle size and strength in wild-type animals. Delivery of a myostatin-inhibitor-protein in dystrophic mdx animals reversed muscle pathology and improved strength, even when administered in 6.5-month-old animals. Specifically, we show here that follistatin-344 resulted in the greatest effects on muscle size and function and was well tolerated with no untoward effects on cardiac pathology or reproductive capacity in either male or female treated animals. AAV-mediated gene delivery to muscle provides a system to generate high levels of protein in the target tissue or by a secreted product carried to remote sites through the circulation (19). We cloned the known secreted myostatin-inhibiting genes, including growth and differentiation factor-associated serum protein-1 (GASP-1) (18), follistatin-related gene (FLRG) (17), and follistatin-344 (FS) (13) into AAV serotype 1, which have demonstrated high muscle transduction capabilities. There are two isoforms of follistatin generated by alternative splicing. The FS-344 variant undergoes peptide cleavage to generate the FS-315 isoform and the other FS-317 variant produces the FS-288 isoform after peptide cleavage. We used the human FS-344 variant, which exclusively generates the serum circulating FS-315 isoform of FS and includes a C-terminal acidic region (20). We chose FS-344 (FS), because the other FS-317 isoform, lacking the C terminus, shows preferential localization to the ovarian follicular fluid and high tissue binding affinity through heparin sulfate proteoglycans, which may affect reproductive capacity and bind to other off-target sites (21). FS-288 represents the membrane-bound form of follistatin (22), is a potent suppressor of pituitary follicle stimulating hormone (23), is found in the follicular fluid of the ovary and in the testes, and demonstrates a high affinity for the granulosa cells of the ovary. We sought to determine the efficacy of these proteins to increase muscle mass in normal and dystrophic mice. We administered 1 × 1011 AAV1 viral particles per animal encoding FS, FLRG, GASP-1, or GFP bilaterally into the quadriceps and tibialis anterior muscles of 4-week-old wild-type C57BL/6 mice. All animals treated with the myostatin inhibitors demonstrated an increase in body mass with an observable gross enhancement of muscles when analyzed at 725-days of age compared with GFP-treated controls (Fig. 1 a and b). Evaluation of individual muscle weights showed an increase in muscle mass for all myostatin inhibitor-treated animals, with the greatest increase in FS-treated animals. The increased muscle mass was found in the injected hindlimb muscles and remote muscles to the injection site, such as the triceps. Thus, these inhibitors were secreted into the circulation from the site of muscle injection, enhancing skeletal muscle mass at remote sites (Fig. 1 c). The enlarged muscle mass was accompanied by functional improvement demonstrated by an increase in hindlimb grip strength (Fig. 1 d). There was no effect on heart mass or histological appearance of cardiomyocytes, indicating that myostatin inhibition was selective to skeletal muscle tissue (data not shown). There has been concern that FS adversely effects gonadal function. We found no change in reproductive capacity in mice treated with our AAV1 carrying the FS344 transgene (AAV1-FS, Table 1) Furthermore, we found no histological/pathological alterations in the gonadal tissue of FS treated-mice compared with controls (data not shown). Myostatin inhibitor proteins increase muscle mass and strength in wild-type C57BL/6 mice. (a) Gross hindlimb muscle mass is increased in all myostatin-inhibitor-protein treated mice at 725 days of age compared with AAV1-GFP injected controls. (b) Total body mass is significantly increased in AAV1-FS-injected (**, P ≤ 0.01) and AAV1-GASP-1-injected (*, P ≤ 0.05) mice compared with AAV1-GFP controls at 725 days of age (n = 10). (c) The mass of individual hindlimb and forelimb muscles is increased in mice injected with AAV expressing myostatin inhibitor proteins (n = 10). *, P ≤ 0.05. (d) Hindlimb grip strength improves >2 years in all treated mice with the greatest differences in AAV1-FS treated animals compared with AAV1-GFP controls (n = 10). Error bars represent standard error. Given the robust effects of FS delivery, we next tested the potential for AAV1-FS delivered postnatally in a clinically meaningful paradigm to increase muscle mass and strength and delay muscle deterioration in the mdx mouse model of Duchenne muscular dystrophy (DMD). DMD is an X-linked recessive disease resulting in the wasting of skeletal muscles and cardiac function, ultimately resulting in death. Recently, FS was investigated in mdx animals overexpressing a duplicated domain of the follistatin gene. Results demonstrated increased muscle mass and attenuated pathology, although the results were only documented to 15 weeks of age (24). In our studies, mdx animals were injected bilaterally in the quadriceps and tibialis anterior muscles with a low (1 × 1010 viral particles) or high dose (1 × 1011 viral particles) of AAV1-FS at 3 weeks of age and followed for 5 months before necropsy. Increased levels of circulating FS were detected in the serum of both low and high dose treated animals with the high dose expressing the greatest levels of serum detected FS (high dose, 15.3 ± 2.1 ng/ml; low dose, 6.8 ± 0.4 ng/ml; GFP controls, 0 ± 0.1 ng/ml; n = 8 per group; P < 0.01). We demonstrated that AAV1-FS increased body mass compared with GFP treated controls, with the greatest increase in the high dose FS group (data not shown). 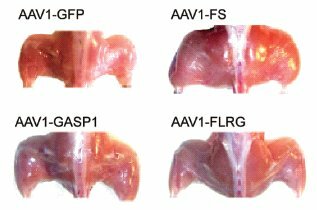 Gross observation of AAV1-FS treated mice displayed a significant increase in muscle size compared with AAV1-GFP treated animals (Fig. 2 a), with the greatest individual muscle weight increase in high dose FS-treated animals (Fig. 2 b). Effects were not restricted to the injected muscles; they were also found at sites remote from directly targeted muscles (Fig. 2 b). Increased muscle mass translated to a dose-dependent improvement in muscle strength in the hindlimbs and forelimbs of treated animals compared with GFP treated controls (Fig. 2 c). Histological and morphometric analyses of AAV1-FS injected muscles and at remote sites demonstrated myofiber hypertrophy, supporting gross observations made at the time of necropsy (Fig. 3 a–c). Furthermore, there was no shift in muscle fiber types in AAV-FS treated animals; however, there were fewer total fibers per square millimeter of area in the tibialis anterior muscle in animals treated with the high dose AAV-FS (Fig. 3 d and e). Strikingly, FS-treated mice demonstrated a significant reduction in serum creatine kinase compared with GFP-treated controls (Fig. 4 a). This is of interest, because FS was protective despite its lack of correction of the underlying dystrophin deficiency. The exact mechanism is not clear, but one might speculate that increasing the strength of individual fibers makes them less susceptible to damage from the stress of normal activities. The involvement of satellite cells in postnatal myostatin inhibition remains to be fully resolved; however, we did not see a statistical change in muscle satellite cell markers for FS-treated animals (data not shown). Single injection of AAV1-FS increases muscle mass and strength in young mdx mice. (a) Gross hindlimb muscle mass is increased in AAV1-FS-injected mdx animals at 180 days of age compared with AAV1-GFP-injected controls. (b) The mass of individual hindlimb and forelimb muscles is increased at 180 days of age in mice injected at 3 weeks of age with AAV1-FS compared with AAV1-GFP controls (n = 15). *, P ≤ 0.05. (c) Grip strength is improved in a dose-dependent manner in young mdx mice injected at 3 weeks of age with AAV1-FS followed for 180 days (n = 15). Red, high-dose AAV1-FS; blue, low- dose AAV1-FS; green, AAV1-GFP controls. Error bars represent standard errors. mdx mice treated with AAV1-FS at 3 weeks of age and followed for 180 days demonstrate myofiber hypertrophy. (a) H&E staining of the tibialis anterior reveals myofiber hypertrophy in AAV1-FS injected muscle compared with AAV1-GFP control. (Original magnification, ×40.) (b) The mean diameter of dark (slow-twitch oxidative), intermediate (fast-twitch oxidative glycolytic), and light (fast twitch glycolytic) myofibers in the tibialis anterior (indicated by hatched line) is significantly increased in mice injected with AAV1-FS compared with AAV1-GFP-injected controls. (P < 0.001; n = 5). (c) The mean diameter of intermediate and light myofibers (indicated by hatched line) in the triceps is significantly increased in mice injected with AAV1-FS compared with AAV1-GFP-injected controls. (P < 0.001; n = 5.) (d) The distribution of dark, intermediate, and light fibers as determined by succinic dehydrogenase (SDH) staining is not changed by treatment with high or low doses of AAV1-FS. (P > 0.05 between all groups; n = 5.) (e) The mean number of fibers counted per an unbiased 0.14 mm2 counting frame is decreased in the tibialis anterior of AAV1-FS-treated mice, given that the mean diameter of myofibers is increased. (*, P < 0.01; n = 5.) Error bars represent standard errors. We also evaluated the potential for AAV1-FS to increase muscle strength in mdx animals when treated at an older age. We found that AAV1-FS injection at 210 days of age increased muscle strength ≈60 days after administration and that the increased strength persisted long-term throughout the 560 days evaluated in this study (Fig. 4 b). As early as 180 days of age, before AAV1-FS treatment, there was evident pathology in muscles of untreated mdx animals, with prominent endomysial connective tissue proliferation and inflammation (Fig. 4 c and d). Pathological evaluation of gastrocnemius and diaphragm muscles at 560 days of age demonstrated that AAV1-FS treated animals had substantially fewer focal groups of necrotic muscle fibers and mononuclear cell infiltrates. Importantly, AAV1-FS treated animals had significantly reduced focal areas of endomysial connective tissue proliferation, which were pronounced in GFP treated animals, demonstrating that fibrosis, a hallmark of muscular dystrophy, was decreased in FS-treated animals (Fig. 4 c). Pathology in the diaphragm also showed that FS-treatment reduced inflammation and fatty replacement compared with GFP-treated animals (Fig. 4 d). Furthermore, AAV1-FS treatment demonstrated significant increases in muscle fiber diameters at this age compared with control GFP-treated animals (Fig. 4 c and d). These results demonstrated that myostatin inhibition by FS treatment was beneficial in aged mdx animals that had undergone multiple rounds of muscle degeneration and regeneration. Translation to a clinical parallel suggests that AAV-mediated FS gene therapy could have potential for the older DMD patient independent of replacing the missing gene and may have a potential role in combinational therapy similar to that demonstrated for IGF-1 and minidystrophin gene replacement (25). These results suggest that inhibition of myostatin by FS-344, delivered by a single AAV1 injection can enhance muscle size and strength and is well tolerated for >2-years. The results of FS344 may offer a more powerful strategy than others targeting solely myostatin because of additive effects, such as follistatin's involvement in multiple signaling pathways, and the recent finding demonstrating a reduction in inflammation in a model of endotoxemia (15, 26). The striking ability of FS to provide gross and functional long-term improvement to dystrophic muscles in aged animals warrants its consideration for clinical development to treat musculoskeletal diseases, including older DMD patients. C57BL/6, C57BL/10, and C57BL/10ScSn-DMDmdx/J were purchased from The Jackson Laboratory. All studies were approved by Institutional Animal Care and Use Committee. The cDNA for human follistatin-344 (FS) was obtained from Origene, follistatin-related gene (FLRG) was obtained from American Type Culture Collection, and growth and differentiation factor-associated serum protein 1 (GASP-1) was cloned from a human cDNA library (Clontech). Recombinant AAV serotype 1 vectors were produced by a contract manufacturing company (Virapur). Mice received bilateral intramuscular injections of a total dose of 1 × 1011 viral particles (high = 1 × 1011, low = 1 × 1010) (n = 10–15 per group) at 3–4 weeks of age or at 6.5 months of age. Muscle strength was assessed weekly, using a grip strength meter (27). Force measurements were recorded in three separate trials and averaged. Mouse coordination was tested by using the accelerating rotarod (Columbus Instruments). Muscles were dissected, weighed, snap-frozen in liquid nitrogen-cooled isopentane, cryostat sectioned, and stained by hematoxylin-eosin (H&E) or succinic dehydrogenase (SDH) for analysis of fiber diameters. Five animals per group were chosen randomly for muscle fiber size morphometry. For each analysis, five representative pictures (one central and four peripheral) were taken of muscle sections, compounding to 0.7 mm2. Images were captured at ×20 magnification, and diameters were measured with a calibrated micrometer, using the AxioVision 4.2 software (Zeiss). Fiber size-distribution histograms were generated and expressed as percentage of total fibers analyzed. Creatine Kinase and Follistatin Assay. Serum CK was performed by using a CK test kit (Pointe Scientific) and expressed as units/liter. Serum was collected at 90 days after injection and assayed by using the human follistatin quantikine ELISA kit (R&D Systems) with normalization to controls. All statistical analysis was performed in Graph Pad Prizm software, using one- and two-way ANOVA with Bonferroni post hoc analysis.